This entry was posted in Health and disease, Nutrition on August 27, 2015 by Sharon Halliday Hattingh. I know this is simply too easy…to suggest that we should live by the wisdom shared by the genius minds of yesterday. But it is tempting, isn’t it, to think that, all we need to do is to listen to the words of those who experienced controversy, who suffered at the hands of the immoral…those who seem to have the secret to survival of life in general. Click here to see all ten quotes. This entry was posted in Quotes and other inspirational words and tagged Collective Evolution, inspiration, Quotes on August 15, 2015 by Sharon Halliday Hattingh. This entry was posted in Body, Body image, Eating disorders, Health and disease, Infograph, Mental health (general), Mind and tagged Anorexia, Body Image, Bulimia, eating disorders, health, Infographic, mental health, Orthorexia, Weight Disorders on August 14, 2015 by Sharon Halliday Hattingh. Teen stress: What’s normal and when to get help | Fox News. The subject of childhood stress and depression seems to surround me this week. Everywhere I turn on the web and in the newspapers, someone somewhere mentions it in one way or another. It is obvious that we are all very concerned for our children. With the memory of the 14-year old who committed suicide earlier this week still fresh in our minds, I would like to continue my discussion on depression, stress and its symptoms. In my opinion one cannot be over-informed on this subject. Our children are precious and they have the right to grow up healthy and successful, without the added emotional baggage that goes with depression, stress and anxiety. It is important that we teach our children how to deal with their issues early on. As parents it is our responsibility to give them the necessary tools to deal with stressors so that they can become adept at using their skills to combat any emotional strain in future. One cannot avoid stress in our day and age, but one can learn to deal with it in a healthy, non-destructive way. We, as parents are not only here to feed and clothe our kids, or give them a home and pay for schooling, we need to prepare them to become adults in an unforgiving world and, in the process, we may learn valuable lessons of our own. Elizabeth Renter recently published an article in Fox News about teenage stress. The article gives insight into normal levels of teen stress and provides a list of tell-tale signs and symptoms that could indicate that the teen is overwhelmed. While teenagers, in general, have a certain amount of stress in their lives, and while some stress can even be beneficial, parents need to be prepared to confront issues if their child presents with these symptoms that show he or she is under abnormal amounts of stress. DO NOT HESITATE TO ADDRESS THE PROBLEM. The American psychological Association conducted a survey in 2013 and found that teens report unhealthy stress levels that exceed those of adults. 31% of teens reported feeling overwhelmed by stress and 30% said stressors were the cause of their sadness and/or depression. [Source: FoxNews]. This article contains added links and has more valuable information about teen stress and depression, please do yourself and your child a favor, click here, and read it in full. This entry was posted in Behaviour, Emotions, Life's issues, Mental health (general), Mind, Society and tagged Childhood depression, Depression, Fox News, mental health, Teenage stress on August 14, 2015 by Sharon Halliday Hattingh. Yesterday an article in one of our local South Afican papers, Maroela Media, shocked the country. A beautiful, talented 14-year old girl jumped to her death from the second storey of a popular mall in Northern Johannesburg. Her parents were caring and considerate, they knew about her worries and she was receiving treatment, yet she still felt it was necessary to take her own life. I cannot imagine the pain those parents are going through….to think that, despite their efforts, their child was still silently suffering. Recently I heard someone say that for every statistic, be it murder, suicide or death by natural causes, a family is torn apart by grief. One should never lose sight of that….death causes pain, but imagine the guilt and confusion when someone commits suicide, when someone suffers from depression, yet hide it so effectively that none is the wiser. Depression is a disease of our times; everyone suffers under the stress and strain, not to mention the trauma, of daily life. Children in pre-school are already pressured into performance, they are measured by a certain yard-stick, they are boxed and packaged and, if they do not fit, they are bullied, scolded and isolated from the ”group”. That is only the beginning….and only at school. Have you noticed how many children in school come from broken homes? Single-parent homes? Children torn in a battle between Mom and Dad, children shunted from one home to another, children with alcoholic parents, children with deceased parents, abandoned children….the list goes on and on and, in the meantime, the pressure builds. In adolescence it only grows….trying to fit in with the crowd, battling to make your grades, please your parents, please your teachers, perform well in extra-curricular activities…and, of course, the old teenage-angst…the hormones going every which way, the love triangles, etc, etc. Adulthood brings more responsibility, more stress – money problems, relationship problems, being pressured into having a successful career, being the best mother/father/spouse, competing on a social level with the in-crowd….it simply never stops. And I am not even talking about the conflict we are bombarded with every day in the media…it seems that the whole world is a confusion of death, war, famine, disease, natural disasters…life is truly overwhelming and many people, adults and children, may feel they are not merely living anymore, they are simply surviving. More than 350 million people of all ages suffer from depression globally. The WHO estimates that depression will be the 2nd highest medical cause of disability by the year 2030, 2nd only to HIV/AIDS. Keeping in mind the connection between depression and suicide, I continued and had a look at the statistics for global incidents of suicide. The global suicide rate is 16 per 100.000 population. This is indeed frightening, isn’t it? To think that people we see everyday, those that we pass on the street, family, friends, may hide this dark secret, this terrible pain…and when they take the final step, we wonder how we could have missed the signs. What could we have done to prevent it? The question remains: How do we prevent suicide? Depression lies at the root of suicidal tendencies and if we are well versed in the typical symptoms of depression, we may be able to save a life. Constant depressed mood – feelings of sadness and emptiness. People may appear tearful, morose or irritable. Diminished interest in activities that previously brought pleasure. Person may seem brooding and isolated. Significant weight loss or weight gain or decrease or increase of appetite. Constant feelings of worthlessness or excessive or inappropriate guilt. Inability to concentrate or to think clearly. Person seems indecisive. If you think someone you know may be in danger, please do not hesitate to confront them directly. Sometimes all these people need is just someone to talk to, a shoulder to cry on…a friend that will understand. The infograph below, compiled by Lifehack.com, will provide more information about the nature of depression. Understanding the disease is the first step in conquering it and, perhaps, saving a precious life. This entry was posted in Emotions, Infograph, Life's issues, Mental health (general), Mind and tagged Depression, Infographic, mental health, Statistics, Suicide on August 13, 2015 by Sharon Halliday Hattingh. ‘When a patient comes to me requesting a Reiki treatment, I know they’re ready to release old energy, patterns, and/or beliefs that no longer serve them. They may be fully aware of this, or just know on a subconscious level that whatever they’ve been doing has not been working. The idea of experiencing a Reiki session to balance their chakras seems to just feel right. The reason why Reiki can be so powerful and effective is because it infuses your chakras and your body, with Universal light energy. Your body takes exactly what it needs to at that point in time. As a practitioner, my responsibility is to simply act as a conduit for Universal energy in order to help healing take place optimally, so that your body can heal itself…..’Continue reading here. ‘Reiki helps us reconnect with our heart, our true center, realigning us with our Higher Self. So when we use Reiki to clear out the energetic debris in our chakras and reconnect to our self-love, as well as our love for others, we become aware of the destructive patterns we’ve been holding onto. That’s when we can start to learn how to break them…..’Continue reading here. ‘During a Reiki session, you’ll feel calmer, and be able to take full, deep and easy breaths. Your muscles start to release tension, your heart rate will become moderate and adrenals will be put at ease. There’s a deep sense that everything will be OK, despite all of your struggles...’Continue reading here. How Reiki Can Help Reduce Stress & Anxiety – mindbodygreen.com. This entry was posted in Alternative therapy, Emotions, Mental health (general), Mind and tagged Anxiety, Chakras, EnergyHealing, mental health, Reiki, Stress, wellness on August 11, 2015 by Sharon Halliday Hattingh. ”Almost nowhere is the mind-body connection more apparent than in the link between depression and heart attack. 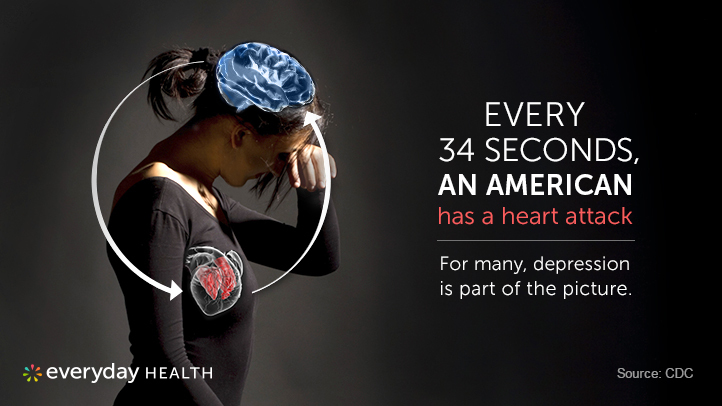 Mental health and heart health are intimately connected when it comes to your heart. Heart disease is consistently the No.1 killer in the United States, according to the Centers for Disease Control and Prevention (CDC). Each year, about 715,000 Americans have a heart attack. And 190,000 of these are repeat heart attacks. Those who have heart attacks are more likely to become depressed, and people with depression have higher rates of heart attacks…………..” Continue reading here. This entry was posted in Body, Emotions, Health and disease, Mind and tagged Depression, disease, Everyday Health, health, Heart Attack, Jennifer J Brown, mental health on August 11, 2015 by Sharon Halliday Hattingh.